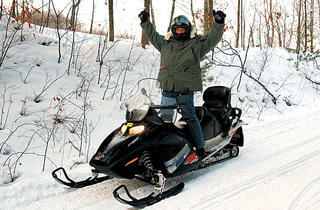 You don't take your vacations sitting down-a winter getaway has to involve skis, sleds, snow and a surge of adrenaline. Cascade maintains a top rep with snowboarders, catering to radicals with four terrain parks outfitted with obstacles, a superpipe and halfpipe, and also to families with a snowtubing park, beginner slopes and a modest hill (460 feet). Its biggest advantage is technological. The park features an automated snow-making system, allowing it to open in mid-November. The combination of man-made and natural snow keeps the north-facing side of the Baraboo Bluffs at a happy medium—neither too slushy nor fluffy. For its size, the mountain sports a diverse set of runs—most painfully short. The bunny slopes on the west side of the hill keep beginners out of experts’ way. Nine black-diamond runs won’t wow West Coasters, but should keep skiers entertained between the mogul fields and sharp descents. Rentals ($34–$44), lessons ($20 for 90-minute group instruction) and lift tickets aren’t dirt cheap—bargain hunters should opt for the three-day lift pass ($88). There’s no lodging at Cascade, but nearby Lake Delton has plenty of off-season vacancies—and offbeat dining. If your bluff-battered bod craves spa services, flat screens and a rain shower après-ski, opt for the well-equipped condos at Rhapsody Resort & Spa (1010 Wisconsin Dells Pkwy, Wisconsin Dells, WI, 866-403-3557, artistaresorts.com; $100–$300/night), some facing iced-over Lake Delton. 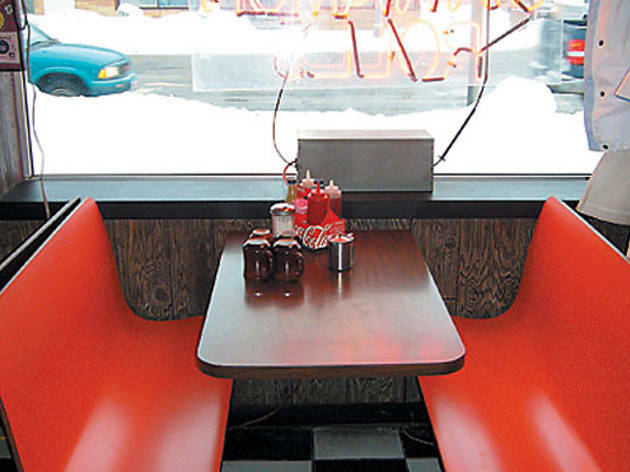 In the morning, make a beeline to Denny’s Diner (2 Munroe St, at Hwy 12 and Rte 23, 608-254-7647)—don’t worry, it’s not that chain—for housemade cinnamon buns. For brunch or lunch, there’s the quaint Cheese Factory Restaurant (521 Wisconsin Dells Pkwy, 608-253-6065), which boasts an old-fashioned soda fountain, a vegetarian menu and housemade desserts. You could easily spend an entire weekend vegging out fireside in one of Justin Trails Resort’s cozy cabins. But if you’re determined to be active, try tackling either the 600-foot or the 1200-foot hill on an inner tube, getting pulled on skis by dogs and cross-country skiing through Wisconsin’s gorgeous wide-open spaces. The resort is pet-friendly, as evidenced by B&B host Donna Justin, who greets four-legged guests with freshly baked dog treats. Her husband, Don, carefully grooms more than ten miles of trails, providing smooth skiing for serious sportsmen and novices alike. Try tubing after sunset, when a thin crust forms on the snow, allowing tubes to rocket and spin with wild abandon. But with no lift, expect to be sweaty, exhausted and exhilarated after one or two tries. The Justins rent snowshoes ($5) and skis ($10) to guests, but they’re thrilled when guests try the lesser-known sport of skijoring, an experience that’s much like water skiing, only on snow…and with dogs. 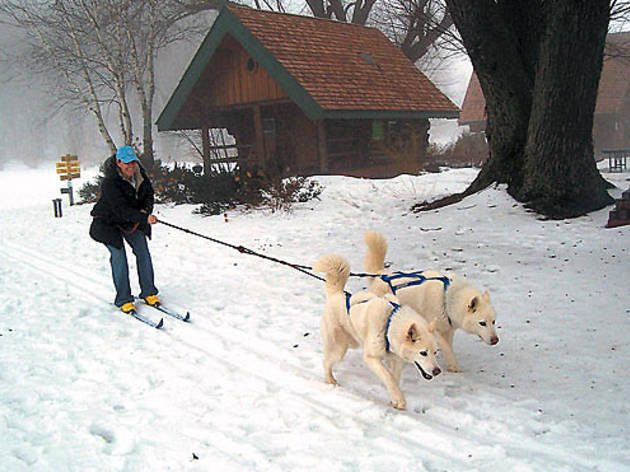 You can use your own dogs, or attach the Justins’ Siberian husky, George, to a harness and let him pull you along on your cross-country skis. The dog works best when someone’s luring them with a treat out front, so expect a short ride—and a lot of laughs. If all the exercise leaves you starving, head into “downtown” Sparta to Angelini’s (142 N Water St, 608-269-6393, angelinis.com), a family-owned Italian joint serving fresh pizza and huge hunks of lasagna. Save room for breakfast: The Justins use organic ingredients in their muffins, pancakes, and homemade granola and yogurt. At that point, you might also want to block off some time for relaxing in the cabin’s oversize hot tub. A little vegging out never hurt anyone, right? It’s a straight shot up I-90 from Chicago to Devil’s Head, which explains why the slopes were filled with skiers in Bears paraphernalia. Even more enticing to cityfolk than the easy drive may be the resort’s Chicagoland Express package: For $293 per person, you get lift tickets for Saturday and Sunday, a hotel room for Friday and Saturday, one dinner, one breakfast or lunch, and up to two pizzas on Friday night when you arrive. That welcome pizza is genius—after a long car ride, chowing down on a pie while tipping back Spotted Cows in the resort’s Devil’s Den Bar (with views of night skiers barreling down the mountain) is a great way to start the weekend. Devil’s Head was constructed in 1970, and it shows: We’re talking lots of dark wood, cinder-block walls and ancient TVs, worn carpet and furniture, and rusty chairlifts repaired with duct tape. Friends, this is not Aspen, but that’s part of the charm—it’s a place to ski, not to drink hot toddies while modeling your Versace jacket. But for a Midwestern resort, Devil’s Head boasts a pretty big mountain (and we use that term loosely—elevation is only 500 feet): There are 28 ski trails (30 percent beginner, 40 percent intermediate, 30 percent expert) and ten ski lifts. The tree-lined runs are impeccably groomed and wide enough that you rarely feel crowded; in fact, if you hit the slopes when they open at 9am, you may get an entire run to yourself. Skiing all weekend burns enough calories that you can eat like a fool with no guilt, and the five restaurants at Devil’s Head are up to the task of feeding you. 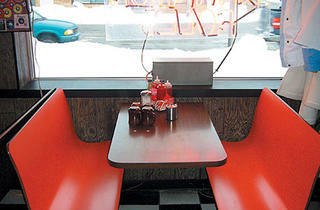 Hit Dante’s for breakfast (French toast, omeletts, pancakes), and grab a beer and burger at Avalanche Bar & Grill. The white-tablecloth Cornucopia is the place to gorge on New York Strip ($39) or cornmeal-crusted U-10 scallops ($30). Just make your reservation for early evening; after a long day of skiing, you’ll be sacked out by 9pm. 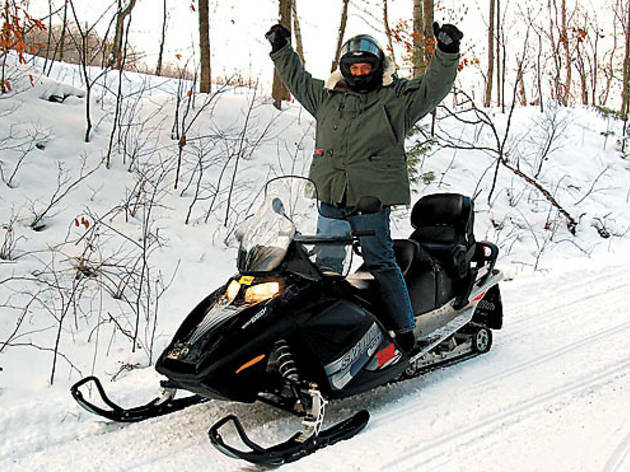 If you’ve never tried snowmobiling, there’s no better spot to get your feet wet than the Cadillac Sands Resort, the only place in town that offers on-site rentals that include lodging, a hot breakfast and all-day use of its Ski Doo sleds (starting at $175 per night, plus $30 insurance and tax). If you made the trek Friday night, you’ll find an oasis at the resort’s 80-degree indoor pool, which stays open till midnight. Hundreds of miles of freshly groomed trails (and two lakes, Mitchell and Cadillac) surround the resort. Get friendly with Chris, the resident “sled master,” and in addition to giving you a map of the local trails (you’ll be on your own) and pimping you out in an abominable snowmobile suit and boots, he might be willing to show you how he can go airborne over a few makeshift jumps. As for your day on the trails, keep it simple and follow the White Pine Trail, the state’s largest rails-to-trail park. While you might spy a wild turkey or deer along the way, most days you’ll find only friendly sledders who are more than happy to point you in the right direction should you get lost, or a local greasy spoon should you need to pack some heat with a cup of chili (we recommend Lakeside Charlies, 301 S Lake Mitchell Dr, 231-775-5332). When you’ve had enough windburn for one day, warm your heels at the resort’s restaurant, Porthole Pub and Eatery, and dig into a grilled pork tenderloin (topped with sun-dried cherries and an amaretto-butter sauce) before taking one last dip in that pool. 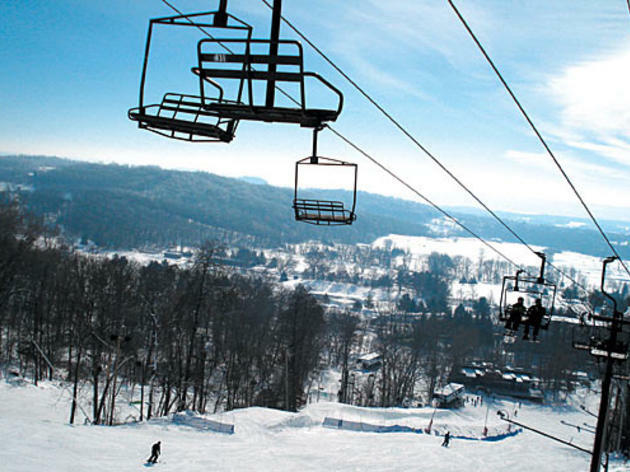 This downhill mecca in Galena, Illinois, boasts 19 runs, and snowboard-friendly features such as a terrain park. 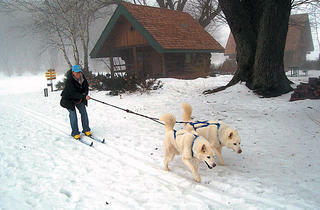 Snowshoeing and cross-country skiing are also available nearby for nonadrenaline junkies. Stay at the resort (8700 W Chestnut Mountain Rd, 800-397-1320, chestnutmtn.com). 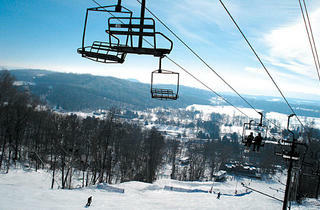 Friday- and Saturday-night lodging and one two-day lift ticket is $105/night. If you’re strictly a boarder, hit the board-specific terrain an hour’s drive away at Raging Buffalo (19N475 Rt 31, Algonquin, IL, 847-836-7243). The hill’s layout changes throughout the season, but expect plenty of halfpipes and jumps. Stay at Courtyard Marriott (2175 Marriott Dr, West Dundee, IL, 847-429-0300). $89–$144/night. Kettle Morraine’s southern “unit,” near Eagle, Wisconsin (two hours from Chicago), offers more forested cross-country trails than you could possibly ski in one weekend. Get a daily ($4) or annual ($20) trail pass and a parking pass ($7) at the Forest Headquarters (S91 W39091 Hwy 59, 262-594-6200). Stay at Eagle Centre House B&B (W370 S9590 Hwy 67, 262-363-4700; $119–$189/night). Rent skis at the LaGrange General Store (W 6098 Hwy 12, Whitewater, WI, 262-495-8600) for $18–$25 a day.